KUET Admission Circular 2018-19. KUET admission Result 2018-2019. Khulna University of Engineering and Technology Seat Plan, Admit Card, Questions Solution has published here. 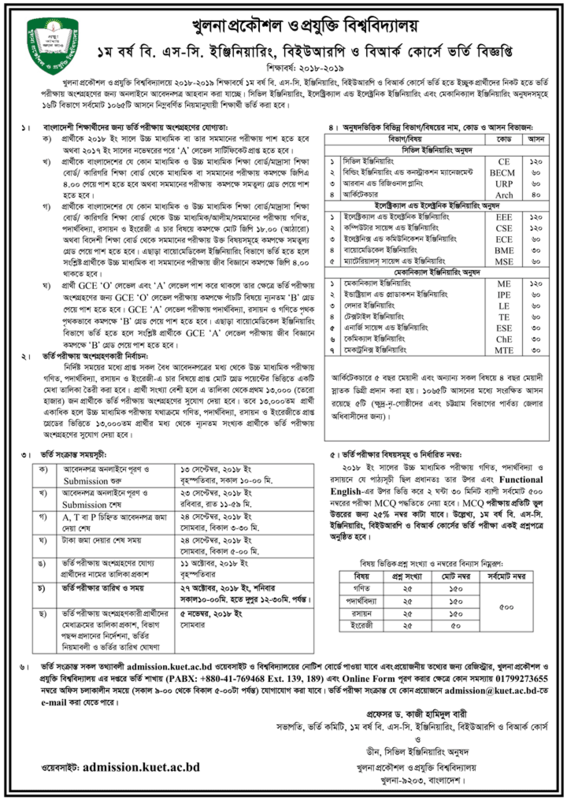 Khulna University of Engineering and Technology has been published KUET admission notice on their official website – kuet.ac.bd. In this notice clear indication that, from 7th September, 2018 admission will start and it will be end on 27th September 2018. But there is a common question that, how to apply in KUET admission 2018. How to get admission Result, Seat Plan, Routine and any others. Dear Viewer don’t worry, by this post we will tell and tell you A to Z information about KUET admission 2018-2019 session. Khulna University of Engineering and Technology (KUET) is one of the best divisional Engineering university in Bangladesh. Generally, in our country when a student complete his HSC from science group, than he and she can apply for this admission. A huge number of students apply for this admission. There is a limited seats for students. There you have some requirements for this admission. Without their requirements you can not apply for this admission. Here is not end, you must have more requirement to admit yourself in KUET admission 2018-2019 session. Online Application Start : 13 September 2018. Online Application End : 23 September 2018. Selected List for Admission Test Publish : 11 October 2018. Admission Test : 27 October 2018 ( 10:00 Am – 12:30 PM). Admission Result : 05 November 2018. Students must obtain at least GPA 4.0 in SSC or equivalent exam. You must obtain total GP 18.00 in Mathematics, Physics, Chemistry and English in HSC or equivalent exam and must obtain at least GP 3.50 in Mathematics, Physics and Chemistry individually and GP 3.00 in English in HSC/Alim or equivalent exam. If you passed from GCE ‘O’ level or ‘A’ level, you must passed in at least 5 subjects including physics, chemistry, mathematics and English with B grade in each at GCE ‘O’ level and must obtain minimum ‘B’ grade in Physics, Chemistry and Mathematics individually at GCE ‘A’ level. At first click the ‘Online Apply Now’ button below or You can Fill Up application through Online (www.admission.kuet.ac.bd). Examine have to submit 300×350 pixel color Photo and 300×80 Pixel Signature. After submit application form, You will get 6 digit application Number and Password. Please save this number and Password. Application will be marked A, T or P on the application form. Download or Print your application copy. After selected list publication Admit Card will publish. Only Selected candidates can download Admit Card for admission test. You can download Admit Card from here. KUET Admission Test Result Will Publish here later. When Result will published we will also publish here. So keep on your eyes on our website. Visit the Readingbd.com. Get admission information, admission date, admission test results and other latest information. Get all public universities of Bangladesh including KUET in the 2018-19 session. If You get more update Everyday, Please like our Facebook Fan Page and get Updates.